The Spanish Fort real estate market is booming and many buyers are being attracted to new construction. Well, in addition to the great Spanish Fort school system and the city’s proximity to highways, shopping, and restaurants, new construction is surprisingly affordable for most people. As a Realtor for Baldwin County, I love working with buyers who are considering a purchase of a brand new home. It’s exciting to help my clients negotiate a price that best fits their budget while getting the features that they really want in their home. By clicking on the neighborhood links below, you’ll be taken to the main real estate page for that area. You’ll find additional information, homes for sale, and property details. Churchill – This is a sough after neighborhood that’s been very popular for a few years. There are still plenty of brand new homes that are being constructed with 3 and 4 bedroom options. Grace Magnolias – These homes are priced between $300,000 – $375,000 and located off of Route 31, just minutes away from plenty of shopping. Highland Park – You’ll find large homes in a desirable location near Spanish Fort schools. Osprey Ridge – Osprey Ridge is one of our newest subdivisions offering homes around $300,000. Located off of Route 31. Quail Hollow – This is the only condo community in Spanish Fort offering townhome style condos with a garage. Rayne Plantation – A very nice neighborhood with big square feet and higher end pricing. Savannah Woods – New construction with 3 and 4 bedroom options for around $125 per square foot. Stillwater – Here you have a well-appointed community with large homes and pricing starting at around $500,000. Stone Brook – Stone Brook is a great example of new construction at around $200,000. A great buy! Stonebridge – Stonebridge is one of the most popular new neighborhoods in Spanish Fort with Craftsman style homes between $225,000 – $350,000. This community has an outstanding amenity package. Timbercreek – This community is large, easy on the eyes, and situated on a championship golf course. You can own new construction here for around $350,000. Walden Subdivision – Large homes with prices in the $500k’s. Although these figures will be periodically updated, they change daily so please contact me if you want to know what the market conditions are right now. Determine what your needs and wants are for your new home. Physically write them down. This creates a great visual for what you have to have and what you would like to have. Compile a list of builders from their websites, online reviews, and recommendations from friends. In some cases a neighborhood will only feature one builder or two. Be sure to do your homework on the builder or get with me (your Realtor) for advice. Make sure that the builder is licensed and insured. What is the potential re-sale value? Set an appointment to see some of their past work. I’ve written an extensive article called the Ultimate Guide to New Construction in Baldwin County. Please check it out for even more information about buying a new construction home. Every builder in Spanish Fort will probably have a different contract. There are a few elements that pertain to buying a brand new home that differs from our typical Purchase Agreements for single family homes. Remember that you’ll have your initial sales price in the contract but while in the process of building there may be allowances and/or add-ons that will come into play. Don’t let the add-ons get away from you. You’ll have to be mindful at all times that the price doesn’t get away from you. Another thing to take into consideration is construction time. 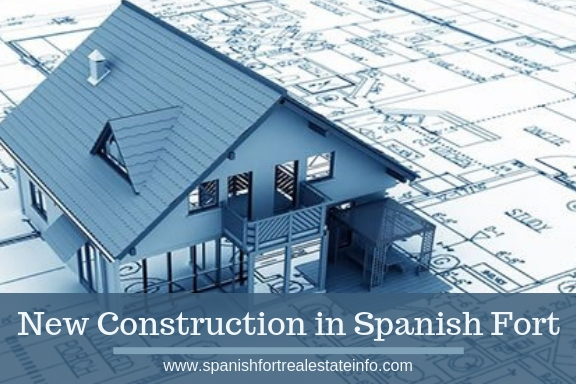 The builder should be able to give you a “general” time of completion however, they can’t control the weather, labor, and delivery of materials. Your closing date may have to extend out longer than you want so have a Plan B for where you’ll live until you can move into your new home. Lastly, you should always get a home inspection (yes, even with new construction). It is worth paying a few hundred dollars more to get extra assurance that everything is in proper working order. Your brand new home should be in near perfect condition. Would you like some advice on how to save thousands of dollars? Do not work with the real estate agent in the Model Home! Many potential buyers ride through new neighborhoods and meander through model homes to get an idea for what is being built. That’s great! However, most of these buyers don’t realize that the agents in the Model Home work for the seller (in this case, the builder). Those agents are bound by real estate law to look after the best interest of the builder, not you. That’s where I come into the picture. I would work for you as a Buyer’s Agent who only has your best interests in mind. I’ll work to get you the best price, the most features, and the best terms. In addition to that, the seller is paying for me to represent you. It’s win-win. You do not pay my commission. 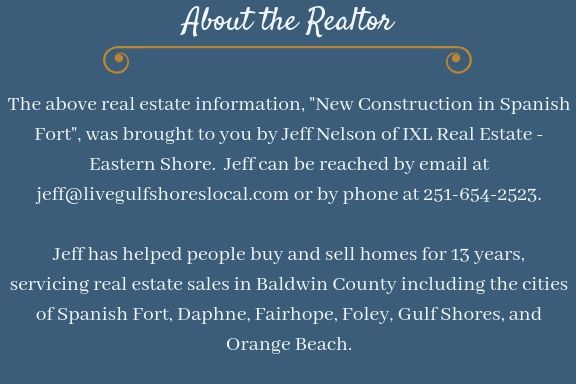 Want to Learn More About Spanish Fort New Construction? If you have any questions at all about a particular house or community, get in touch with me. If I don’t already know the answer, I’ll get it for you. Let’s work together to find you a wonderful home in a great town!